In 2012 US Geological Survey statistics ranked Chile fourth in the world for untapped gold reserves, after Russia and ahead of the United States. 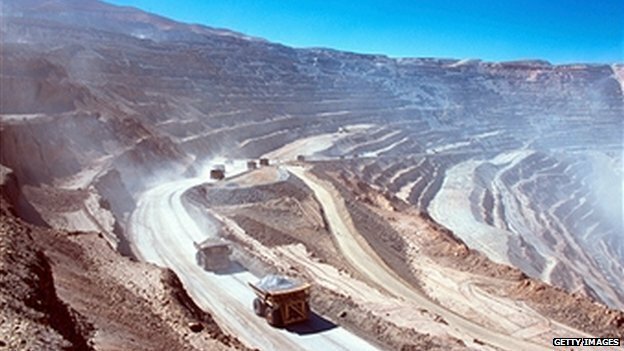 Chile’s supreme court has halted the development of a gold and copper mine owned by the Canadian conglomerate, Goldcorp, until indigenous communities are consulted. The court upheld an appeal filed on the El Morro mine by the Diaguita community in northern Chile. The community said the mine, worth almost $4bn, could pollute a local river. Several recent mining projects in Chile were blocked after local opposition. In April, a lower court rejected the Diaguita’s request to halt the project because, the community said, Goldcorp had not conducted proper consultations with local communities. A fresh consultation will now need to take place before an environmental permit can be awarded allowing mining to take place. Goldcorp has had to suspend construction at the El Morro site twice, once in 2012 and then again in November of 2013. Last year, Chile’s environmental regulator blocked work on the massive Pascua-Lama gold mine run by Barrick Gold, straddling the Argentina-Chile border after Diaguita communities living in the foothills of the Andes downstream opposed it. With nearly 6m tonnes mined each year, Chile is the world’s chief copper producer but also has huge untapped gold reserves. In 2012 United States Geological Survey statistics suggested Chile is now fourth in the world in terms of untapped gold reserves, after Russia and ahead of the United States. This could happen to Haiti if requests to mine natural resources are allowed. The profits go elsewhere while the nation suffers.